No other part of Britain has more in common with Scotland, or more invested in the Scottish referendum result, than the North East of England. As London becomes ever more disconnected from the rest of the country it’s maybe not surprising that some in the capital think that England is indifferent to the independence referendum. But there are plenty of people living ‘North of Hadrian’s Wall’ – i.e. in Newcastle and Northumberland (the wall runs underneath the castle above the quayside) – and the wider North East who care passionately about the future of Scotland. We may have fought each other for about 700 years but I’ve always detected a mutual respect between the Scots and the Geordies. I recall in particular being in Bridge of Allan when, during some good natured England v Scotland football banter, a local man interjected with “no he’s a Geordie, they’re alright”. And we do share so much, from our patterns of speech – bairns, lassies, doon the Toon – and a shared culture built on heavy industry (and heavy drinking) sardonic humour and Labour-ish politics, to a reputation for aggression – nemo nos impune lacessit – tempered with a certain warmth and conviviality. We even have the same number of UKIP MEPs. 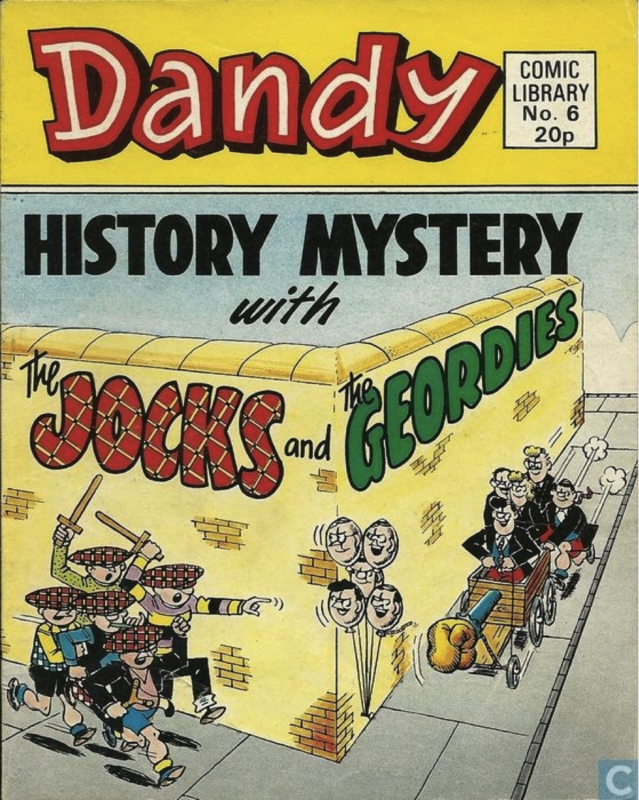 Some of this is well known, even the stuff of caricature, and although there are some differences between us, we share so many enduring industrial, intellectual and even martial traditions that to speak of ‘North Britain’ doesn’t seem too fanciful. I’ve got nothing against English identity per se but Englishness makes me think of Guy Ritchie films or John Majorish images of warm beer and Morris dancing (Geordie folk dance is much better), whereas my British identity is based as much on how alien Southern England can feel compared to Scotland, as well as an understanding of my own family’s story. 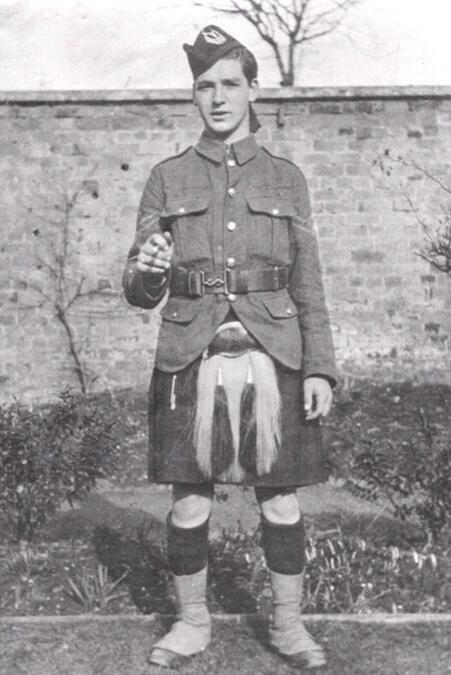 One of my prized possessions is a photo of a handsome young corporal in the Gordon Highlanders. Hugh Dillon was my grandmother’s cousin, killed at Loos in September 1915. Hugh’s forebears originally came from the West of Ireland, settling first in Lanarkshire and then Dundee, while some of his siblings then migrated south to the Northumberland coalfield (we still have relatives in Carfin). It’s always fascinated me how much working class families would move around back then and its legacy was not the Britishness of Empire and Rule Britannia, but an identity based on familial bonds and shared experience. Coming from Northumberland Scottish things have been a constant in my life, nurtured first by parents who bought me The Broons and Oor Wullie annuals at Christmas (the Sunday Post is still taken in the North East), and tittered along to Rab C. Nesbitt, Naked Video and, latterly, the peerless Still Game. My father’s best pals were his Glaswegian workmates who’d relocated to Newcastle from IBM’s plant at Greenock, and I can vividly remember the boisterousness of ‘Glasgow Shipyard Fortnight’ when holidaying Scots would migrate en masse to Whitley Bay just down the coast from where we lived. As kids we drank Barr’s pop and ate Scotch pies, Tunnock’s teacakes, and ‘Cowan’s Highland Toffee’. We took character-building family holidays in places like Pittenweem and Rosemarkie, not to mention regular trips to the Edinburgh Tattoo. 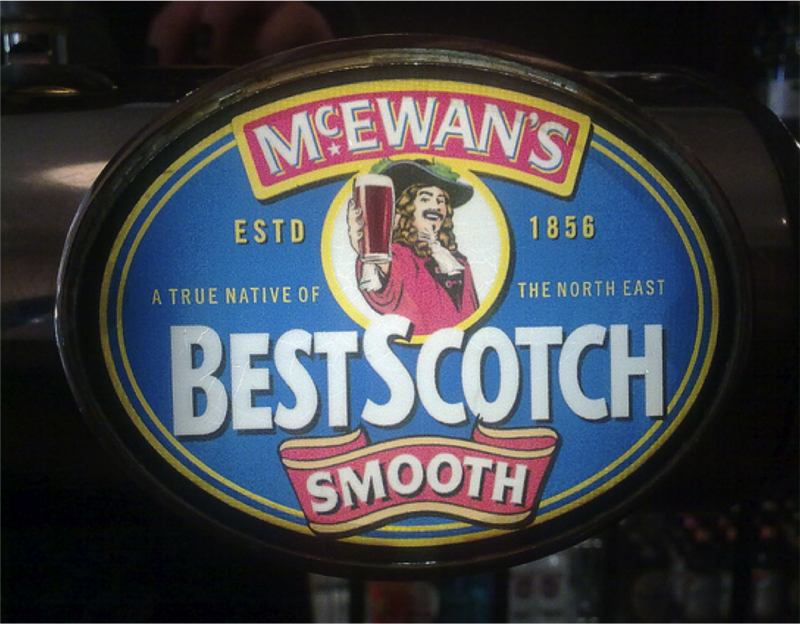 The first beer I ever bought was a pint of McEwan’s Best Scotch, my first flat was round the corner from St Andrew’s Kirk in Newcastle (by the old Deuchars Brewery on Sandyford Road), and my first boss at Fenwick’s was a taciturn ex Royal Marine from Govan (callow 18 year old me: “Have you read ‘Lanark’ by Alasdair Gray?”, “No I havenae, now g’wan and empty the bailer”). I even honeymooned in Stornoway (I know how to impress a woman). Following the Hanoverian peace, the toughness of border life was merely recast into a sort of industrial warfare in the nineteenth century, where the dangers of heavy industry placed great emphasis on strength, resilience and solidarity and formed the sort of the ultra-macho Geordie culture lampooned so well by the Viz and others. 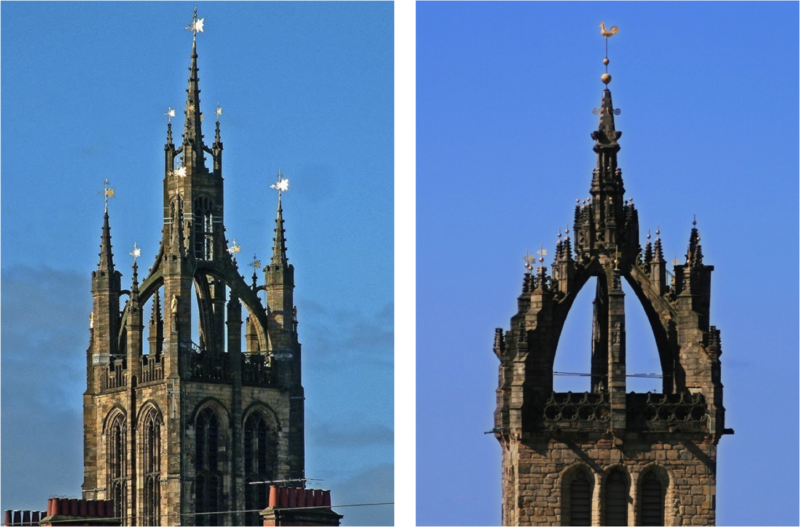 Scots military prowess is well known of course, but Northumbrian feats of arms from Flodden to Trafalgar were also a big part of the North East’s identity. This martial culture arguably reached its climax between 1914 and 1918 when North East England raised a record-breaking 98 battalions of Northumberland Fusiliers and Durham Light Infantry – two of the hardest fighting regiments in the history of the British Army. According to the North East War Memorials Project there are 101,000 names recorded on memorials between Berwick and Redcar, and the losses in units like the Tyneside Scottish Brigade suggest an even greater level of sacrifice than the oft-cited (though contested) figures for Scotland. In the Second World War Monty depended on his battle-hardened ‘Northern Legions’ (the 50th Northumbrian and 15th Scottish Divisions, often working in concert) as the shock troops of the British Army. Such service in the ranks remained typical after the war, and one of the early legends of the SAS recalled that life in the regiment in the 1960s was dominated by “Geordies, Jocks and Scousers’. 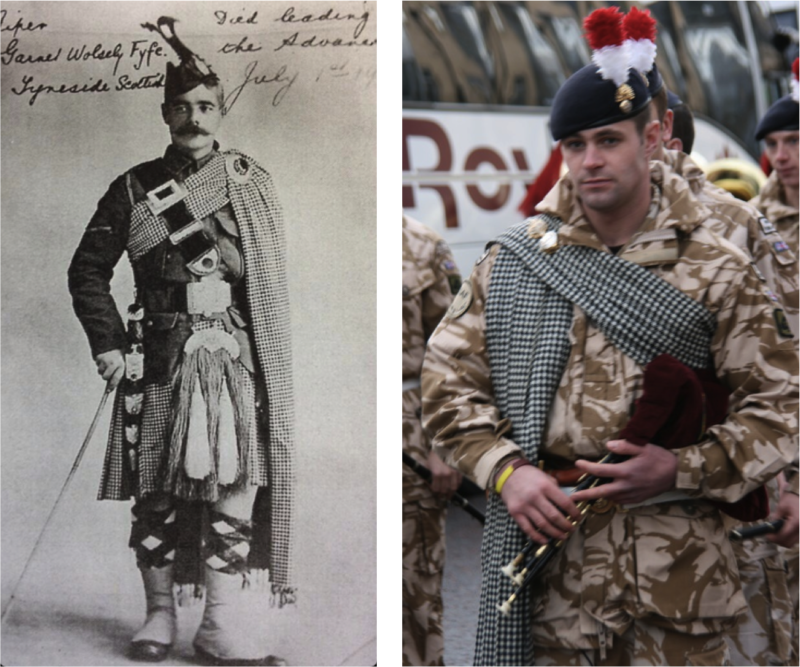 The raising of the Tyneside Scottish had shown the appeal of ‘military Scottishness’. (They even had their own authentic tartan to wear: the Shepherd’s or ‘Northumberland Plaid’ reputedly the oldest tartan in these isles.) As their official history described, this resonated in North East England even for those with no Scots blood, and built upon centuries of migration to Tyneside. In fact, the Union formally united two parts of this island for whom the Anglo-Scottish border had always been highly permeable and merely reflected fluctuating dynastic politics rather than any significant differences in culture. Edinburgh is named for a King of Northumbria after all, and Rory Stewart’s thoughtful Borderlands series demonstrated very effectively the shared heritage of the land between the firths of Solway, Forth and Tyne. Consider the famous ‘reivers’ for whom the border meant very little – being, as they were ‘Scottish when they will and English at their pleasure’. We shouldn’t forget too that the ‘Scotch-Irish’ in America actually included the ‘Border English’ too, for these same bellicose families had been transplanted from the borderlands first to Ulster to ‘pacify’ the Irish, and then deliberately settled in the dangerous back-country of Appalachia to fight the native Americans. In Linda Colley’s seminal Britons she records how the poor in the North East consumed oatmeal like the Scots and had the same ‘raw high-boned faces and thin angular physiques’. Indeed, ‘to pass from the borders of Scotland into Northumberland’, a Scottish clergyman wrote at the end of the eighteenth century, ‘was rather like going into another parish than into another kingdom’, an observation that John Buchan would note a century later as he passed into England from his beloved Tweeddale. This was true even before the Scots diaspora reached Industrial Tyneside. By the early 1500s there were hundred of Scots living in Newcastle, including John Knox who was appointed a preacher at St Nicholas’s Church in 1550. Many of the coal miners recorded on Tyneside in 1637 came from Scotland, and of the keelmen working on the Tyne in 1740 a majority came from ‘Fife, Stirling and Lothian’. By the time of the ’45 so many Scots had made Tyneside their home that the native Northumbrians differentiated what they saw as ‘the savage highlanders’ from the more civilised lowland Scots, with whom they shared a loyalty to ‘King Geordie’ and the Protestant succession (although it should be remembered that significant funds were raised on Tyneside for the relief of the Highland famine in the 1840s). A second wave of Scots migration to Tyneside shipyards and coalmines helped to establish what some have called a ‘North British Industrial Zone’ that linked places like Newcastle, Glasgow, Liverpool and Belfast as well as outliers like Barrow-in-Furness. North East England and West Central Scotland were the only places in the world with large scale engineering, shipbuilding and coalmining all in the same place, a nexus so critical to the technological developments essential to capitalism and the wealth of Britain: Scotland gave us the steam engine, the pneumatic tyre and the telephone, whilst North East England gave us the railway, the turbine and the lightbulb (oh yes). Some of Tyneside’s greatest industrialists had strong Scottish connections: George Stephenson had worked in Scottish collieries as well as those on his native Tyneside (his statue in Newcastle depicts him in quasi-Scottish dress), and Sir William Armstrong’s business partners were the Scotsmen Charles Mitchell and Andrew Noble. 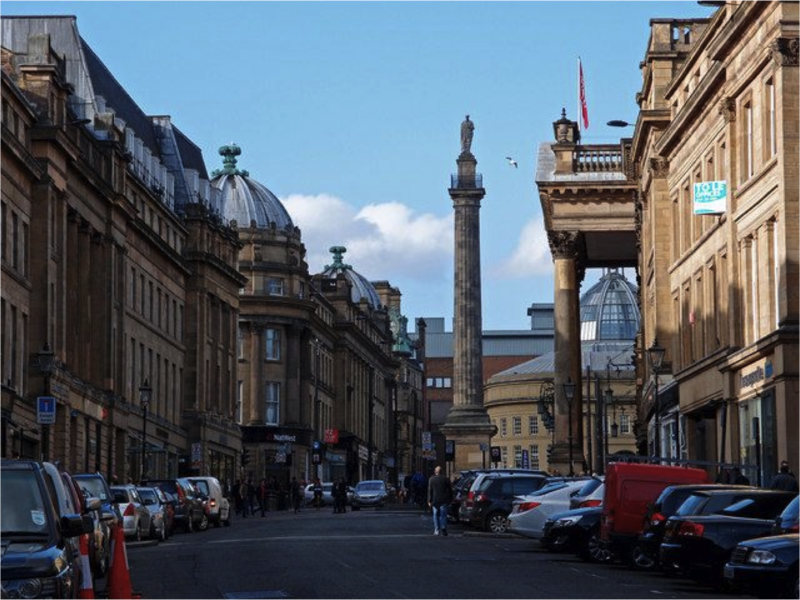 Newcastle’s art gallery was bequeathed by the Scottish distiller, Andrew Laing, the Jesmond home of the shipbroker Sir Arthur Sutherland is now Newcastle’s Mansion House, and the famous South Shields-based waxed jacket business was established by a Scotsman, John Barbour. Scots played a huge part in Tyneside’s maritime trades: hundreds of Shetlanders settled in South Shields, many of the Scots ‘fisher lassies’ who followed the trawler fleet down the East Coast made their home in North Shields, and so many Scotsmen came to work at Andrew’s Leslie’s shipyard that Hebburn became known as ‘Little Aberdeen’. Thousands of families, including mine, crisscrossed the Anglo-Scottish border in the late nineteenth and early twentieth century – and figures like Arthur Henderson, Manny Shinwell and latterly James Herriott and Mark Knopfler spent their early lives swapping Tyne and Wear for the Clyde (and vice versa). You see this in the career of the theatrical impresario Arthur Jefferson who owned theatres across ‘North Britain’ but principally on the Tyne and the Clyde. It is significant that his son, Stan Laurel (who always considered himself a Tynesider), actually made his first professional appearance in his father’s theatre in Glasgow. This movement of people and ideas from Scotland heavily influenced North Eastern taste and culture, in everything from architecture and football to religion and political thought. Presbyterianism was particularly strong in Northumberland and key figures in Scottish religious history like the secessionist Ebenezer Erskine, and Robert Morrison, the first protestant missionary to China, were actually from Northumberland. As was Thomas Bewick‘s mentor the Revd James Murray, who arrived in Newcastle in 1764, preaching fiery sermons on the equality of man ‘in a loud manner with a Scottish accent’. The Scottish Enlightenment found an important echo in Northumberland, where as in Scotland, over a third of adults were able to read in the 1700s (much higher than other parts of England) and Newcastle alone in that period had no fewer than 36 private academies – as well as the Royal Grammar School and the charity schools – and was, after London, the chief urban printing centre of England. This was a milieu in which women found unusual opportunities for self-expression too. One thinks of the first English feminists Mary Astell and Elizabeth Elstob, both from Newcastle, but also Catharine Cockburn (the wife of a Scots clergyman in Northumberland) who published work defending John Locke’s philosophy in 1702 and corresponded with Leibnitz and Congreve, right up to Pauline Trevelyan writing reviews for the Edinburgh Review and The Scotsman from Wallington Hall. 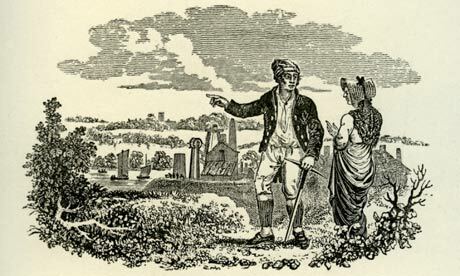 With typical Southern condescension Dr Johnson said that Scotsmen came to Newcastle to be ‘polished by colliers’, but, tellingly, books and newspapers from Scottish printing presses were read avidly in Northumberland and subjects like ‘Scottish political economy’ were regularly debated by members of the Newcastle Literary and Philosophical Society – still the largest private library outside London. The ‘Lit & Phil’ was established in 1793 – over fifty years before the London Library – and was, until England finally got a third university at Durham in 1834, the embodiment of a ‘Northumbrian enlightenment’ which so shaped the region’s political outlook. Take the great Aberdeen-born historian of Newcastle, Eneas MacKenzie, a notable early member, who presided over the town’s protests against the Peterloo massacre in 1819, before becoming one of the leading Chartists in a region where political reform was a popular cause. Or the great historian and compiler of Northumbrian Minstrelsy John Collingwood Bruce (a Glasgow University alumnus) who led pilgrimages to the Roman Wall for Northumbrians rediscovering their border identity in the nineteenth century. It became common too for the gentry and bourgeoisie of the North East to send their sons to Edinburgh University, and its alumni included noted Northumbrians like the poet and royal physician Mark Akenside, the mathematician George Walker, the industrialists Robert Stephenson and Sir Lowthian Bell, and the Northumberland shepherd boy Thomas Kirkup whose ‘History of Socialism’ was such a influence on Mao Tse Tung. (Edinburgh returned the favour through Burke and Hare who robbed graves on Tyneside as they did in Auld Reekie). 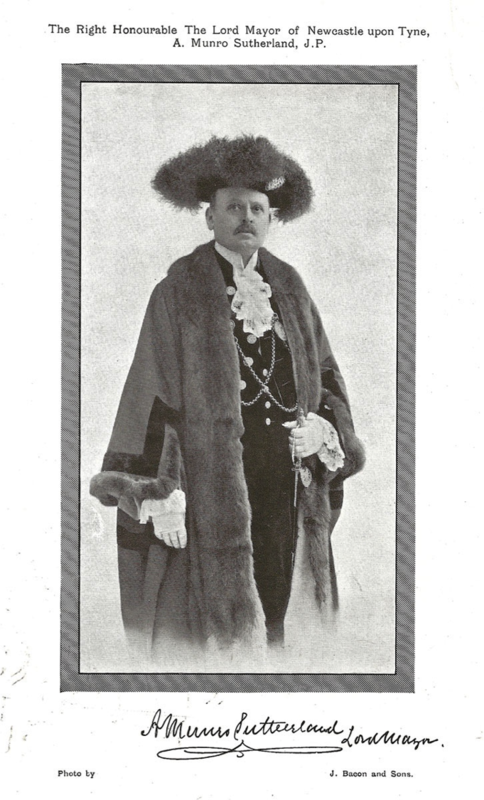 The Newcastle Radical MP Joseph Cowen was another Edinburgh alumnus and his popular brand of liberalism made Tyneside, like Scotland, a bastion of high-minded Gladstonianism – which verged on republicanism to such a degree that Queen Victoria would reputedly close the blinds on the Royal Train as it passed through Newcastle on the way to Balmoral. Scottish and Northumbrian tastes overlapped in several other fields too. While Victorian England went crazy for the neo-Gothic, classicism was the prevailing architectural form in nineteenth century Tyneside just as it was in Scotland, and the great John Dobson was heavily influenced by the elegant terraces of Glasgow and Edinburgh (and Dobson himself designed the Glasgow Customs House). 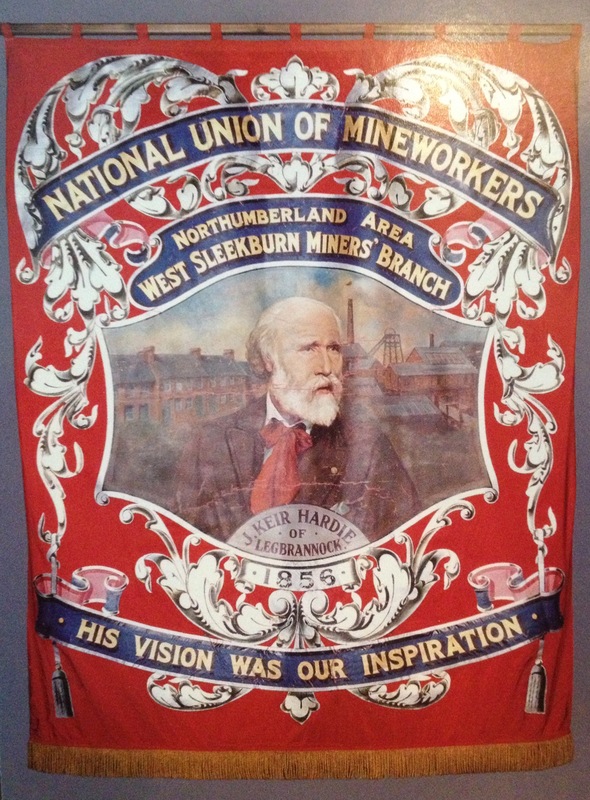 What is more, just as the majority of the Scots working classes lived in tenements, by 1914 the North East was unique in England for the numbers of people living in flats, specifically ‘Tyneside flats’ (45 per cent compared to 3 per cent nationally). But the influence had historically worked both ways. Much of Georgian Edinburgh is built from Northumberland sandstone, but even earlier than that the architects who built Durham Cathedral – ‘half church of God, half castle ‘gainst the Scot’ (in the words of Sir Walter Scott) – were taken to Scotland by King David II to build Dunfermline Abbey, and the quintessentially Scottish ‘crown steeple’ of places like St Giles’s Cathedral or Glasgow cross, was actually copied from the ‘strange airborne tabernacle’ (cf Ian Nairn) of St Nicholas’s Cathedral in Newcastle. An enthusiasm for the bevvy unites us too, and our drinking patterns have always been very similar. Whisky was drunk (and illegally distilled) in great quantities in the North East. 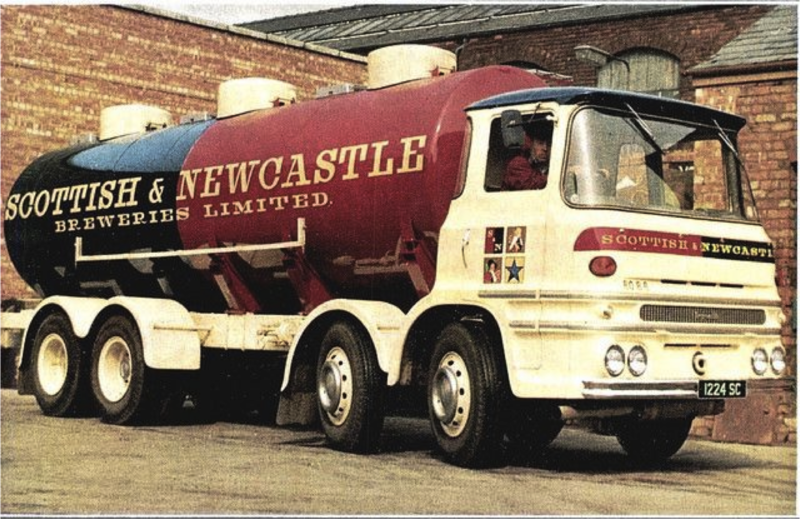 Newcastle claims to be the first town in England to have brewed ale, but Scottish beer like Youngers, Deuchars and McEwans were always staples of Tyneside pubs. Indeed the tartan carpets of Scottish & Newcastle Hotels were a good illustration of this shared culture – as were the huge numbers of pubs in the North East named for Scotland’s military hero Colin Campbell – aka ‘Lord Clyde’ (although it was wise to know your blood group before going in ‘The Sir Colin Campbell’ in North Shields). Pioneering Scottish footballers were at the forefront of the game’s development in the North East, beginning with famous Victorian amateur teams like Hebburn Argyle and Shankhouse Black Watch, to the professionals who made Newcastle United and Sunderland so successful at the turn of the century. My father’s two favourite footballers were Newcastle’s Scottish hardmen Jimmy Scoular and John McNamee, but there’s a litany of great Scots who’ve graced St James’ Park and Roker, including Hughie Gallagher, Bobby Mitchell and Ronnie Simpson for the Magpies, and ‘Slim Jim’ Baxter, Bobby Kerr and Ian Porterfield for the Mackems. There were so many Scots footballers in the North East that between 1925 and 1928 the Robert Burns Memorial Trophy match took place annually at St James’ Park between teams of ‘Home Scots’ and ‘Anglo Scots.’ Lest we forget too that the last Scotsman to score at the old Wembley (in a handy 1-0 win) was a Geordie born in Gateshead. Another shared tradition was music and poetry. From the Ballad of Chevy Chase to the Blaydon Races, the North East is one of the few parts of England with a strong indigenous folk tradition, albeit one heavily influenced by Scotland. Northumberland has its own distinctive bagpipe of course, but cross border musical collaborations take in the Eurythmics, Franz Ferdinand and even ACDC. However the most intriguing Scots-Geordie collaboration may well be the most celebrated Scottish song of all time. ‘IT’S COMING YET FOR A’ THAT, THAT MAN TO MAN THE WORLD O’ER, SHALL BROTHERS BE FOR A’ THAT’. Auld Lang Syne has a similar message of brotherhood, but the melody may well have been borrowed from an opera written by a Gateshead composer William Shield. There seems to be enough evidence to suggest that Burns and Shield had borrowed the tune from a much older song, and Burns himself stated that he ‘took it down from an old man’s singing’. Given that Burns wrote the words in 1788 could he have heard that old man on his visit to Newcastle the previous year? It’s a beguiling thought, and entirely possible given the shared culture of Scotland and North East England. But even if we do have a shared history the Scottish Referendum is about the future. I’m sure that the warmth of Scots-Geordie relations will endure whatever happens, but it is notable how debates about independence or further devolution for Scotland are stirring similar debates within England. It was interesting to hear the leader of Glasgow City Council point out that his city has more in common with cities in Northern England than it does with much of the rest of Scotland, how he doesn’t want to ‘turn people from Newcastle into foreigners’, and that a shared future should be based on ‘radically devolve[d] power and resources to city regions across Britain’. This is an idea that is now gaining ground in England. After all, for the North East, an English parliament would just be as far away as the current British one. The Prince Bishops of Durham had the powers of a king for centuries, and the ‘debatable lands’ of North East England were only fully integrated into a centralised English, then British, polity not long before Scotland was, so what price the restoration of our ‘Northern Liberties’? Indeed, in the recent European elections the ‘Yorkshire First’ party pointed out that the white rose county ‘has a larger population than Scotland and an economy twice the size of Wales but with the powers of neither’, add in North West England, and the North East (the only English region with a positive balance of trade), alongside a devo-maxed Scotland, and a powerful ‘North British’ bloc could emerge to transform how Britain is governed. But economics aren’t everything. For me at least, the emotional pull of these centuries of shared history really means something – from the Scots and Geordies who fought together and worked together on D-Day to the burning deck of Piper Alpha, or Mrs Gemmell who taught me in primary school and the wonderful nurse from Arbroath who looked after my grandfather in his final days. However Scotland votes I’m sure we will remain their staunchest friends, but I must admit that the thought of becoming foreigners to each other is pretty unbearable. I really hope Scotland doesn’t forget its auld acquaintances in the North East of England. “Me too” ism from someone who wants to use Scottish exceptionalism as a Trojan horse to balkanise England. That didn’t go down too well in the 2004 referendum. I am sure you will say that is because the proposal did not offer enough powers, so here’s a thought, if you really believe your are so different from the rest of us, have the courage of your convictions, go for full independence and finance yourselves. Alternatively join the Scots with whom you have so much in common – if they will have you. This really is a terrific read. I have only visited Northumbria a couple of times. We were last there about 10 years ago and vowed to go back but we never did. I’ll put that right this summer, make a point of visiting some of the places you mention and impress the hell out of my wife with my in-depth knowledge of the region. I have always voted for the SNP as I have always felt that Scotland’s particular geography, demographic, industries, agriculture, fisheries, natural resources, problems and opportunities were so far removed from the concerns of Westminster that only through independence could we get the government we need to create the kind of society we want and achieve our full potential in the world. Over the last thirty years, this gulf between Westminster and the political has only widened. From your article, I think you understand this position. The status quo is unacceptable and devolution is not on the ballot paper. Devo max is what people would have voted for and Salmond had requested it but Cameron ruled it out. Although I am personally in favour of independence, I concede that the majority of Scots would have preferred devo max. If Cameron knew that, then he deliberately obstructed the democratic wishes of the people of Scotland. If he didn’t know that, then that proves my point that Westminster is not fit to govern Scotland. Nevertheless, the polls indicate that most people are currently still against independence. Many of my friends who are No voters are motivated to vote No by these ties of kinship and friendship you mention. For my part, all we are asking for is the opportunity to govern ourselves. I understand there will be consequences, but whatever happens, I am certain we will indeed remain “staunchest friends”. One thing that baffles me is your use of the word “foreigner”. This seems to be a big issue for No voters as it comes up regularly in discussions. It seems to be used as some kind of pejorative term – something you wouldn’t want to be, or something you wouldn’t want someone you love to become. It’s as if you view foreignness as some kind of disease. That’s how it comes across to me. Would you be kind enough to explain why being or becoming “foreign” matters? Don’t worry – nothing about the dismantling of the political union after a Yes vote will mean that the people of the borders and the people of the north east wont continue to be friends…….. we certainly won’t be foreigners. We have to do this. No rancour, no severing of bonds, none of the daft myths of alienation. Look at this way: if we don’t, what follows? I’ve lived in that debatable land, too, for long enough. I’ve never really understood the ‘don’t turn us into foreigners’ mantra. Between me, my wife and my parents we have 4 different nationalities. It’s not like we can’t sit around the dinner table or that I love them any less just because they are a ‘foreigner’. In fact, I don’t understand anyone that would even label someone else in that way. Most Scottish families have connections, family or otherwise, to people from Canada, Ireland, Australia etc. and it’s not like we aren’t on speaking terms or not as close just because we have our own national governments. Some folk south of the border seem to take Scottish Independence as some kind of personal rejection of their British/English identity, perhaps through a mistaken belief that Independence is somehow fueled by anti-English sentiment. I think it also reflects the very different, and more distant, relationship Scottish people have with the concept of Britishness. English people, generally, are more connected to it, and therefore a rejection of Britishness is perceived to be a rejection of them. This is why as a supporter of independence I often encounter an instinctive hesitance (or outright hostility) from some English folk towards independence. Northern England is slightly different in that I think many people understand what its like to be sidelined by the South East of England, in this case though we have a chance to choose our own path but I do genuinely hope Northern England can find its own voice within the Westminster system. You’re absolutely correct to point out that Scotland and the North of England will continue to have good relations after a Yes vote. We aren’t floating off into the North Sea and all that shared history, whether it’s D-Day or our industrial heritage will continue, it isn’t wiped away because certain policy portfolios are transferred from Westminster to Holyrood. Anyway congratulations on a very informative piece, I learnt a lot from it! A lovely article. I truly agree that there is an undeniable bond between Scotland — especially the Lowlands — and Northern England. I have a caravan in the Borders, and I still feel as though I am in the same country anytime I pass the sign that reads ”Welcome to England”. 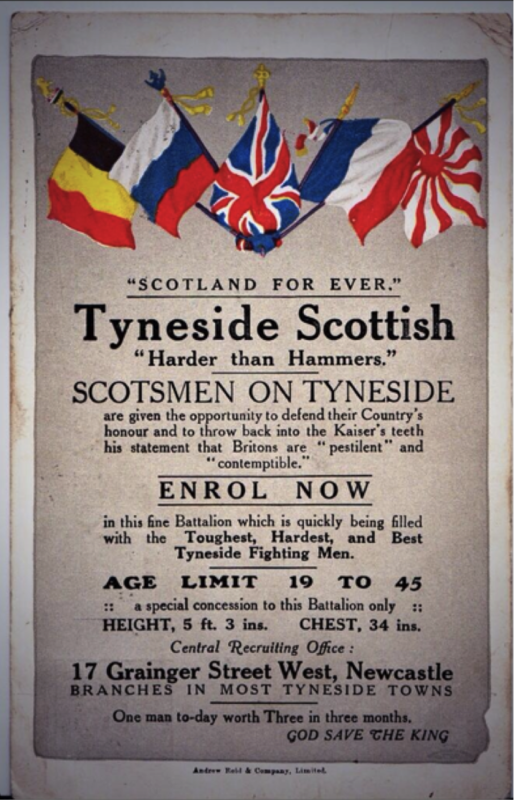 I did not realize, though, how many Scots were based in the Tyneside area. 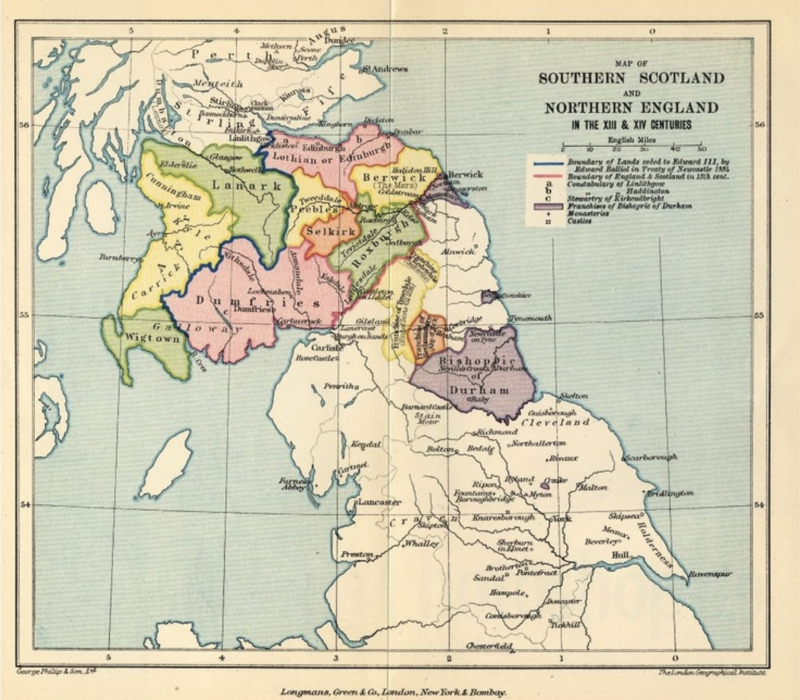 Any antiquarian or historian will tell you about the Kingdom of Northumbria and how the Anglo-Scottish border became established at the Tweed. The division between the two ”nations” is political rather than cultural, as the Border Ballads will attest. Sometimes, when I am walking through the tranquil woods and fields of Berwickshire, I can see England stretching beyond until its horizon disappears by the coast; and it seems to me there is little difference in the landscape. It is tempting to say that Lowland Scotland and Northern England — specifically the North East — is almost its own single domain, but that would be catering to nationalism, which I have no sympathy for at all. No matter how many referendums or Brexits we get, we will always be friends.